With clarity and compassion, Dr. Robert Sears guides the reader through the maze of autism, explaining what precautions parents can take to decrease their baby's risk, how to detect autism at the earliest possible age, and how to proceed once a diagnosis has been made. The book provides parents with a simple and clear understanding of the biomedical treatment approach that Dr. Sears has used successfully with many of his young patients. It lays out a plan for developmental, behavioral, and learning therapies; shows parents how to begin treatments without a doctor's help; presents information on vaccines and their safe use; and includes an extensive resources section. 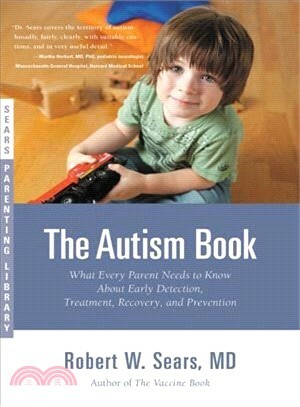 THE AUTISM BOOK provides all the information and reassurance parents need. Robert Sears is a board-certified pediatrician in private practice with his father, William Sears. He received his medical degree from Georgetown University and completed his pediatric training at Children's Hospital in Los Angeles. He is the author of The Vaccine Book and HappyBaby, and the co-author of The Baby Book (revised edition), The Premature Baby Book, and The Baby Sleep Book.